Mass of Christian Burial will be 11:00 a.m. Wednesday, February 3, 2010 at Mary of the Immaculate Conception Catholic Church in Rockville, MN for Shirley C. (Eisenschenk) Molitor, age 49, who died Friday as a result of a car accident. Burial will be in the Calvary Cemetery, Rockville. Relatives and friends may call after 4:00 p.m. Tuesday and from 9:00 – 10:30 a.m. Wednesday morning at the Wenner Funeral Home in RICHMOND. Parish prayers will be at 7:00 p.m. followed by a rosary with the Christian Women, Consecration and Rosary Groups. DigElog Moments capturing Shirley's talented, giving and beautiful family. With Bob Brink just 6 wins shy of 900 for his career, DigElog ROCORI would like to take a look back at some of the stories we covered with Coach Brink. 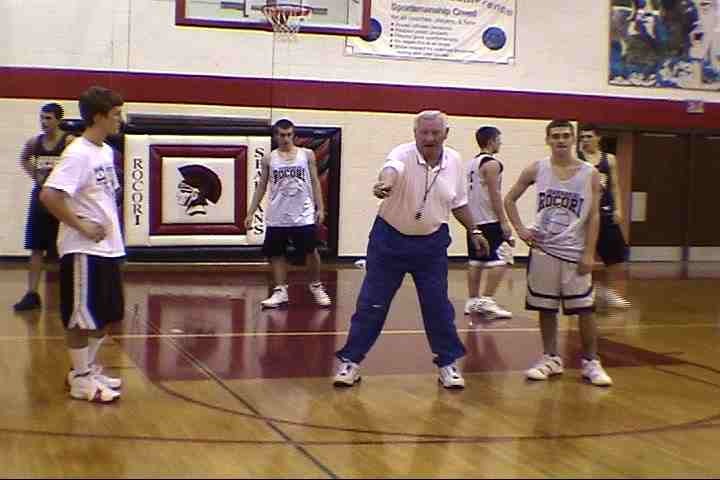 Here is a look at the ROCORI Spartans 2005 season. Senior co-captains Chad Willenbring, Aaron Traut and Garrett Branstner sharetheir thoughts about the up-coming season. In this story you will hear from a number of people involved with Thrifty White Pharmacy, the brand new pharmacy in Cold Spring. Just over a week ago, it was announced that Walgreen’s would be buying Snyders and that the local pharmacy was going to be closing its doors in Cold Spring. Immediately, city officials began putting the pieces together to bring another pharmacy to Cold Spring. Thrifty White Drug worked with Mayor Schmitz, City Administrator Larry Lahr and Jim Kraemer of the Economic Development Agency to see if it was feasible to bring a new pharmacy to town so people in the community did not have to take their business elsewhere. Thrifty White had excellent assistance from Larry Lahr arranging contacts and helping expedite the process of bringing in a new pharmacy. With the help of these city officials we will be able to open a new pharmacy tomorrow! Normally this process takes 8-12 weeks. DigElog ROCORI was on-hand at the ribbon cutting ceremony where CEO Bob Narveson discussed how this project came together. As of yesterday, the pharmacy was approved for their pharmacy license by the inspectors. 1. Please be patient, the staff must acclimate to a new computer system. 2. Prescriptions will still be delivered to customers that may need this service. 3. Please request refills a few days before you run out. That way, if it is not in stock, Thrifty White will have time to order the prescription. Tonight the DigElog Network will broadcast the ROCORI Spartans vs. Willmar Cardinals Boys Basketball game. The game will be aired on tape delay and uploaded in 10-minute increments. Be sure to check out all of the highlights from this game as ROCORI Head Coach Bob Brink closes in on 900 wins. Here is a quick look at the 4th Annual Soup and Chili Bowl hosted by the Cold Spring Jaycees. The event will be held at the Cold Spring Brewery Distribution Center. Also, check out last years coverage from the 3rd Annual Soup and Chili Bowl. The third annual Jaycees Soup and Chili Bowl was held on Saturday January 24, 2009 at the Cold Spring Brewing Distribution Center. Over 1800 people came through the doors on the blistery evening, and those who attended got a chance to sample some of Minnesota’s best soups and chilis. Profits from the event will go toward the ROCORI Trail project. Those who attended contributed over $500 in cash as well as donations totaling to over 1,200 pounds of food for our local food shelf. Altogether the event was an astounding success. Hats off to the Jaycees and all that helped to make this event possible. See you next year at the 4th annual Soup and Chili Bowl. Here's a combination of over 100 photos that the staff at DigElog put together in a music photo montage of the event. Special thanks to Deb and Brian Eisenschenk for sharing these pictures with us. The tragic events in Haiti have brought together international superstars of music and film for one of the biggest events in broadcast history. Hope for Haiti Now: A Global Benefit for Earthquake Relief took place on Friday, January 22. The main events took place in New York, Los Angeles, and London with performances from Wyclef Jean, Bruce Springsteen, Mary J. Blige, Shakira, Sting, Alicia Keys, Christina Aguilera, Dave Matthews, John Legend, Justin Timberlake, Stevie Wonder, Taylor Swift, Jay-Z, Bono, The Edge, Rihanna, and more. Now you can download the Hope for Haiti Now live performance album — which contains the studio collaboration, "Stranded (Haiti Mon Amour) - Version 1.0," featuring Jay-Z, Bono, The Edge, and Rihanna — as well as the video of the entire two-hour telethon so you can relive all of the top-notch performances. CLICK HERE FOR GREAT MUSIC and the DONATE TO A GREAT CAUSE! Thrifty White Drug Opens in Cold Spring as early as next week Wednesday. Thrifty White Drug is pleased to announce that it will be opening a pharmacy in Cold Spring. The recent sale of the Snyder Drug store and subsequent closing of the store has left the community without a pharmacy. Thrifty White Drug worked with Mayor Schmitz, City Administrator Larry Lahr and Jim Kraemer of the Economic Development Agency to see if it was feasible to bring a new pharmacy to town so people in the community did not have to take their business elsewhere. Thrifty White had excellent assistance from Larry Lahr arranging contacts and helping expedite the process of bringing in a new pharmacy. With the help of these city officials we will be able to open a new pharmacy in just a few days when it normally takes up to 8 or 12 weeks. Thrifty White has a 126 year history of operating pharmacies in smaller, rural communities and is excited to work with the community to keep pharmacy services available in Cold Spring. Thrifty White has a pending pharmacy license with the Minnesota Board of Pharmacy. The opening date will be determined by how quickly we get final approval from the Board of Pharmacy. We are hoping to be open by the end of January at the latest. Thrifty White plans on operating its pharmacy in the Schurman Retail Center until a larger drug store can be built or located. Lynn Schurman along with Alpha Development, Ordean Peterson and Jim Webb have been extremely helpful in making a space available to us on short notice so the community can go as few days as possible without a local pharmacy. The address is 20 South Red River Ave, Suite 100. We are interviewing current Snyder Drug employees and hoping to fill as many positions as possible from that staff. We can fill prescriptions for you prior to the pharmacy opening through our central pharmacy and have them mailed to your home. Prescriptions filled this way will transfer into the new Cold Spring store as soon as it is open so you will not need to transfer prescriptions back into town if you use this service. You can call in your prescriptions to our toll free number (866) 903-5720. We will need the name of your prescription drugs, your doctor’s name and the information on your prescription insurance card. We will contact your doctor to obtain a new prescription for you. Please call in your prescriptions a few days prior to running out so they arrive at your home in time. We anticipate a very hectic first few weeks since every prescription will require extra work and time to get it into our pharmacy system. Please bring your prescription insurance card to the store with you to reduce the time it takes to enter your insurance information. We will need to receive a new prescription from your doctor before we can refill a prescription. We ask for everyone’s patience as we create a new pharmacy in record time and train all employees on our computer systems. To avoid a long wait at the pharmacy as we contact your doctor, please call in your refill information a couple of days in advance. Thrifty White will offer the same services as previously provided such as prescription mail out service, deliveries and an interest free 30 day charge program. Patients that use the same medication month after month can notify the pharmacy to have their prescription automatically filled and waiting for them on a set day of each month. Just ask about our “Ready Refill” program for more information. The company offers a ninety day $11.88 generic savings programs on over 350 prescription products. Thrifty White Drug has contracts with most insurance companies and should be able to fill your prescription even if the insurance hasn’t been accepted in the past. Let the store personnel know which insurance plan you would like to use and we will look into contracting with that provider. Thrifty White Drug is an employee owned chain of 88 drug stores based out of Maple Grove, MN. Only current and past employees own shares of the company. Employees share in the results of the company through an Employee Stock Ownership Plan (ESOP). In this way the profits of the company return to those employees that work in the rural communities where the company operates. The company is one of the 100 largest companies in the United States owned by its employees. The company has been in business since 1884 and has always operated pharmacies in communities similar to Cold Spring through out North and South Dakota, Minnesota, Wisconsin, Iowa and Montana. Surrounding Thrifty White stores are located in Willmar, St. Michael, Osakis, Alexandria Brainerd, Princeton and Milaca. All of the prescription records from the pharmacy in Cold Spring will be available to our pharmacists in all other Thrifty White stores if you need a prescription filled while traveling. Thrifty White Drug is very excited to be in Cold Spring and looks forward to providing for the health care needs of the community as we have in similar communities for over 125 years. In November of 2009, the ROCORI Trail Committee held an open house at the ROCORI High School. The open house gave community members the opportunity to listen to local officials, trail committee members, and other experts share their personal involvement with the trail. At the end of the meeting, the floor was open to the public for questions. If you would like more information about the ROCORI Trail project, contact your local city hall. The news of the closing of Snyder Drug has caused a great deal of concern, and set in motion a great deal of conversation over the past week. City officials had no advanced notice, and learned of the troubling news through reports from the staff of our drugstore. Nor had there been any hint to City leadership that a change might be on the horizon, so it came as an incredible shock to all of us as well. The efforts of the City to ensure that we have a pharmacy and drugstore in our community began the moment that the news broke. Early conversations made it quite clear that there was no hope of persuading Walgreens to keep this location open, so the efforts were focused on courting a new pharmacy to begin as quickly as possible. Members of the City Council, staff, and our Economic Development Authority have spent many hours and held countless phone conversations with the ultimate payoff occurring yesterday when the Minnesota Board of Pharmacy agreed to suspend their normal operating procedures to allow for a process for a pharmacy to be licensed in a matter of only days; saving would could have been (quite literally) months. The City is very happy to announce that Thrifty White Drug is working ambitiously to open a store in Cold Spring as soon as possible, and possibly as early as the middle of next week. The exact opening date is beyond the control of the company to some degree due to that fact that the Minnesota Board of Pharmacy must inspect and approve the location prior to conducting any business. The City showed many possible locations to Thrifty White Drug, and in the end they selected the site of the new Schurman Retail Center (right across the street from City Hall). You’ll note that finishing work is well underway on the northern-most suite on the lower level. We’ve been told that it’s likely that we’ll see a lot of activity on Saturday and Sunday with the company installing fixtures and furnishings. It’s important to note that this is thought to be just a temporary location for Thrifty White. The goal of the City’s leadership was to keep any time without an open pharmacy to an absolute minimum. Identifying a permanent location is a matter that is left largely up to private market forces in such cases. So although the City will assist in any way that we are asked to in that process, the City will remain objective and let the parties work out those matters. The City’s leadership has had a great deal of conversation with Thrifty White’s top management, including their CEO and President; and we have been pleased with how well that relationship has gone. We’ve been told that they’ve been equally pleased with the assistance that the City has provided to them during a crazy, but immensely successful period of about one week. A second goal for the City in this process has been to preserve the jobs for the employees of our existing drug store. The City communicated this message clearly to Thrifty White throughout the hurried process; and we are very proud to report that they appear to have taken this request to heart. We hope and expect that in the near future the same friendly and reliable staff will be assisting you with your prescriptions. The team that worked so hard on this process over the past week has been impressed with how it appears that this company will likely be a much improved fit for Cold Spring. Thrifty White is a company that has been in existence for 126 years. Their locations are in smaller, rural communities; and are exclusive to the Midwest. They are a Minnesota-based company (Maple Grove). Perhaps more important than any of these traits, the company is 100% employee-owned. If you’d like to learn more for yourselves, check out their website: http://www.thriftywhite.com/. In the upcoming days and weeks we expect that there will be more information regarding this incredible turn of events, but the City wanted to provide a report as early as possible to keep the public informed of this critical situation. There are countless studies as well as first-hand accounts from our Cold Spring businesses about the benefits of money that is spent and re-spent in our town when residents shop in Cold Spring. Accordingly, it was critical that we keep this core business in our community. It is hoped that the effort invested in this project over the past week will serve as a reminder to all of us of the importance of the credo…shop locally!